Our Pumpkin Spiced Amber Ale is a perfect brew for fall. This beer has caramel-like sweetness..
Our Pumpkin Spiced Porter has rich malt flavor with notes of caramel and chocolate. Spiced wi..
A classic saison with its golden hue, fruity Belgian character, and refreshingly dry finish. Fruit.. Inspired by Sierra Nevada Pale Ale, this brew is our take on a classic. This sunny golden ale is r.. The Russian Five Imperial Stout is the big, bold, glorious brew you need to pull you out of the de.. Inspired by Bell's HopSlam, this boozy Double IPA features a hearty blend of grapefruit, pine and .. 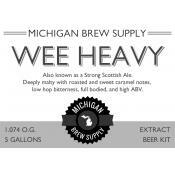 This "Wee Heavy" Strong Scottish Ale is deeply malty with biscuit and caramel flavors. Esters of p..